This is the story of a young man and the starfish, inspired by Loren Eiseley. It illustrates the enormous needs in our world and how many of us are like the "wise" man. Our challenge is to choose our beach and make a real difference in the world. A wise man was taking a sunrise walk along the beach. In the distance he caught sight of a young man who seemed to be dancing along the waves. As he got closer he saw the young man was picking up starfish from the sand and tossing them gently back into the ocean. "What are you doing?" the wise man asked. "The sun is coming up and the tide is going out; if I don't throw them in they'll die," said the young man. "But young man, there are miles and miles of beach with starfish all along it - you can't possibility make a difference." 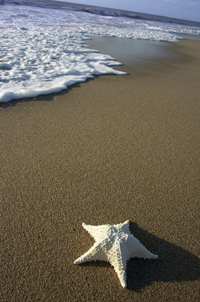 The young man bent down, picked up another starfish, and threw it lovingly back into the ocean, past the breaking waves. "It made a difference for that one, he replied.